Modafinil is a medication approved for the treatment of excessive daytime sleepiness due to narcolepsy, shift work sleep disorder and obstructive sleep apnea. It belongs to a class of drugs known as wakefulness promoting agents or stimulants. It is not a true amphetamine-like stimulant and so it is not considered a narcotic, although it is still considered a controlled substance by the United States Food and Drug Administration (FDA). It is manufactured in the United States by Cephalon and marketed under the brand name Provigil. In the 1970s, French scientists who were working with the pharmaceutical company Lafon invented a group of benzhydryl sulfinyl compounds which included modafinil and a similar drug called adrafinil. Adrafinil is a prodrug which is metabolized into modafinil, thus it takes longer to achieve the desired effect. 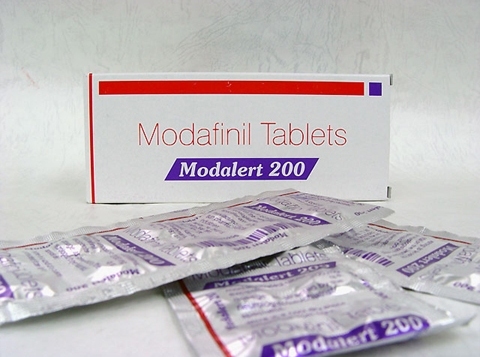 Modafinil has been available in France under the brand name Modiodal since 1994. Cephalon Inc leased the rights from Lafon and the drug was approved for use in the United States and became available under the brand name Provigil in 1998. Lafon was eventually bought out by Cephalon Inc in 2001. It is also marketed in India by Sun Pharmaceuticals under the name Modalert. Modafinil is approved in the United States for use in the treatment of narcolepsy (a chronic neurologic disorder which causes excessive daytime sleepiness and sudden sleep attacks), shift work sleep disorder (a circadian rhythm sleep disorder caused by disruption to natural sleep patterns due to things such as constantly changing sleep schedules caused by shift work) and obstructive sleep apnea (a disorder caused by short periods where one stops breathing for short periods of time during normal sleep, resulting in disrupted sleep patterns). In some other countries it is also approved for idiopathic hypersomnia (excessive sleepiness for which no cause can be determined). Modafinil has been investigated for many off-label uses (indications for which it has not been officially approved). It has shown to have some positive results in the treatment of depression, schizophrenia and ADHD. However, it was rejected for use by the United States Food and Drug Administration in 2006 for use in the treatment of ADHD in children under the age of 18. Cephalon’s label prohibits the use of modafinil in people under the age of 18 for any condition. Modafinil has been used to treat the fatigue associated with multiple sclerosis, as an adjunct therapy for antidepressants where fatigue has been shown to be a significant side effect and for the fatigue reported in patients who suffer from fibromyalgia, chronic fatigue syndrome, Parkinson’s disease, myotonic dystrophy and spastic cerebral palsy. Modafinil is currently being investigated for use in cocaine addiction, weight loss, post-chemotherapy cognitive impairment, fatigue related to primary biliary cirrhosis and general mood elevation in people with treatment resistant depression. Modafinil has similar effects to other central nervous system stimulants such as methylphenidate and amphetamine. However, there are differences in the chemicals that are affected in the brain which makes it different than the other traditional stimulants. Modafinil primarily binds to the dopamine transmitters in the brain, causing the reduced reuptake of dopamine. This leads to increased availability of dopamine in the brain without causing its increased production. Modafinil displays more selective wake-promoting effects than other stimulants do and increases locomotor activity. It can also cause euphoric effects and alterations in perceptions, along with mood and thinking changes similar to those of other CNS stimulants. Modafinil does not seem to have the same cardiovascular effects as other stimulant drugs and does not seem to cause the withdrawal symptoms that other amphetamine-like drugs do. However it does carry the same potential risks for abuse and dependence. Warnings some United States athletes tested positive for modafinil, causing much controversy in the sporting world. On August 3, 2004, 10 days before the start of the 2004 Summer Olympics, modafinil was added to the World Anti-Doping Agency’s “Prohibited List”. It was found that modafinil’s stimulant effect does indeed enhance an athlete’s physical performance. What Are The Side Effects When Using Modafinil?